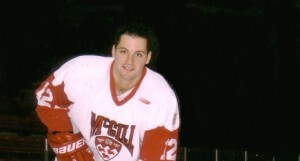 Mathieu Darche played four seasons at McGill, where he was an All-Canadian, earned team MVP honours and registered 170 points, including 78 goals, in 133 games. The Montreal Canadiens and their fans will be happy to forget about the team’s 4-3 overtime loss to the St. Louis Blues last night, but for the newest member of the Habs, it was surely a night to remember. McGill grad and former Redmen captain Mathieu Darche was lined up at right wing on a line with Tomas Plekanec and Mike Cammalleri for the game’s opening faceoff. The 33-year-old Ville St. Laurent native became only the third McGill University graduate to skate for the Canadiens and the first in 72 years, joining aptly-named left winger Jack McGill, who played from 1934 to 1937 and defenceman Nels Crutchfield (1934-35). Wearing number 52, Darche logged nearly 10 minutes of ice time in the game, earning two shots on goal and one hit along the way. Darche a 6-foot-1, 210-pound left winger, previously played in the National Hockey League with Columbus, Nashville, San Jose and Tampa Bay. In 102 career NHL games, he has scored eight goals and 24 points with 26 penalty minutes. At the time of his call-up on Tuesday, Darche was serving as captain of the Hamilton Bulldogs, the Canadiens American Hockey League affiliate where he has scored 16 goals and 25 points in 32 games under the guidance of head coach Guy Boucher and assistant coach Martin Raymond, both of whom were former captains and coaches with the McGill Redmen. Darche has been the top goal-scorer with five different AHL teams. In nine AHL seasons, he has racked up 212 goals and 231 assists for 443 points to go along with 290 PIMs in 552 regular-season contests with Syracuse, Milwaukee, Hershey, Worcester, Norfolk, Portland and Hamilton. In 2003-04, he helped Milwaukee win the Calder Cup league championship. Darche is the 10th player out of McGill to make the NHL and is one of 158 Canadian university players who have made the lofty leap to hockey’s highest level. He originally signed as a free agent with Columbus in 2000 after four seasons with McGill, where he was an All-Canadian, earned team MVP honours and registered 170 points, including 78 goals, in 133 games. He also played one season of varsity football at McGill, won the Forbes trophy as male athlete of the year, and graduated with a commerce degree in 2000. Darche’s 34-year-old brother Jean-Philippe, a former all-star linebacker at McGill, played nine years as a long snapper in the National Football League, including two seasons with the Kansas City Chiefs after seven years with the Seattle Seahawks.